A family of fragrance – the alliteration is satisfying; a satisfaction matched by the joy of first discovering a fragrance that works, then learning that there are other family members that share the same values. A glorious example of this is Prada's Infusion family – the name refers to the ancient process of drawing soft, fresh notes from the root of a plant – which was devised by Daniela Andrier of Givaudan under the creative direction of Miuccia Prada, and features a line up of nine exquisitely complimentary members. 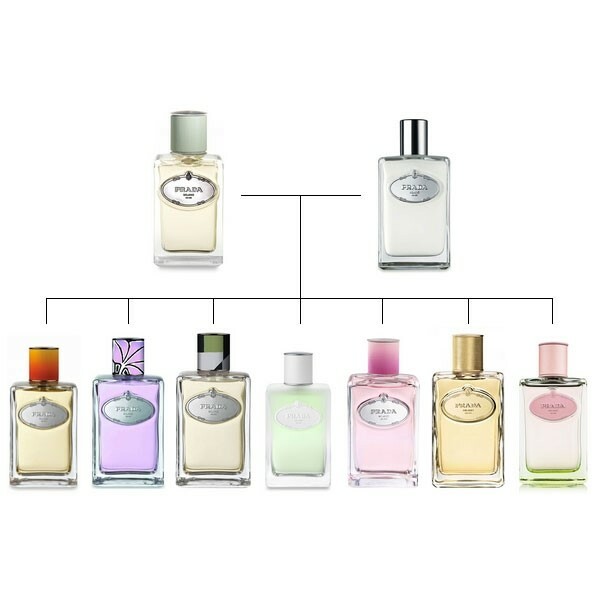 Let us think of Infusion d'Iris eau du parfum as the mother, the leader of the group. She is modern and elegant, opening with notes of mandarin, galbanum, orange and orange blossom which lead to her heart, composed of iris, cedar and vetiver. Her base is composed of incence and benzoin. “This perfume does not mimic any current trends in perfumery. It does not follow any olfactory or descriptive stereotypes of what a woman should smell like, but rather expresses itself through its contrast between a great freshness and apparent lightness," explained Andrier at the time of its launch. Indeed the iris has long been regarded as the most precious, coveted, aesthetically alluring ingredient in the fragrance industry. "Infusion d'Homme is a clever composition, one of the jewels in the Prada fragrance crown"
In 2008, the mother was joined by Infusion d'Homme, the father of the family, and one of the standout members of the group. His talent lies in his subtlety; he is fresh, clean and unique, he smells just as extraordinary on women as he does on men. Infusion d'Homme takes his lead from d'Iris but instead combines neroli, cedar wood, vetiver, incense and benzoin. It's a clever composition, one of the jewels in the Prada fragrance crown. In 2009, the nose Andrier chose to introduce Infusion d'Oranger, leading with orange blossom, subsequently followed by Infusion de Tuberose, Infusion de Vetiver and Infusion de Rose. The rose fragrance was distinct with its striking packaging, bearing the fantasy print for Prada S/S08 collection by Taiwanese-American artist James Jean. In 2010, came Infusion d'Iris eau de toilette – similar to her mother, yet lighter in touch. Nose Andrier chose to combine iris with neroli, lily of the valley, violet, heliotrope, cedar and galbanum for this new family member. In 2012, a more intense, richer and more oriental edition of d'Iris arrived, under the name Infusion d'Iris Absolue, mixing notes of exotic Tunisian neroli, orange blossom, iris from Florence, mastic, benzoin from Laos, tonka bean from Venezuela, Madagascar vanilla and white musk. The latest family member – Infusion d'Iris L'Eau d'Iris – debuted this month, inspired by spring flowers and the fusing of iris and laurel in the gardens of Tuscany. She opens with green accords of Moroccan mint and Tunisian neroli. Pink laurel bay, lily of the valley, rose, iris and orange blossom are placed in her heart. The velvety base includes accords of white musk, woods and vanilla. The limited edition Prada Infusion D'Iris L'Eau d'Iris is available in 100ml, priced £51.00.